A method is described for analyzing protein degradation using radiolabeled and luciferase-fusion proteins in Xenopus egg extract and its adaptation for high-throughput screening for small molecule modulators of protein degradation. Chen, T. W., Broadus, M. R., Huppert, S. S., Lee, E. Reconstitution Of β-catenin Degradation In Xenopus Egg Extract. J. Vis. Exp. (88), e51425, doi:10.3791/51425 (2014). Xenopus laevis egg extract is a well-characterized, robust system for studying the biochemistry of diverse cellular processes. Xenopus egg extract has been used to study protein turnover in many cellular contexts, including the cell cycle and signal transduction pathways1-3. Herein, a method is described for isolating Xenopus egg extract that has been optimized to promote the degradation of the critical Wnt pathway component, β-catenin. Two different methods are described to assess β-catenin protein degradation in Xenopus egg extract. One method is visually informative ([35S]-radiolabeled proteins), while the other is more readily scaled for high-throughput assays (firefly luciferase-tagged fusion proteins). The techniques described can be used to, but are not limited to, assess β-catenin protein turnover and identify molecular components contributing to its turnover. Additionally, the ability to purify large volumes of homogenous Xenopus egg extract combined with the quantitative and facile readout of luciferase-tagged proteins allows this system to be easily adapted for high-throughput screening for modulators of β-catenin degradation. Xenopus laevis egg extract has been used extensively to study many cell biological processes including cytoskeletal dynamics, nuclear assembly and import, apoptosis, ubiquitin metabolism, cell cycle progression, signal transduction, and protein turnover1-17. The Xenopus egg extract system is amenable to the biochemical analysis of a legion of cellular processes because egg extract represents essentially undiluted cytoplasm that contains all the essential cytoplasmic components necessary to execute these processes and enable investigation. Large quantities of egg extract can be prepared at one time for biochemical manipulations that require large amounts of material (e.g., protein purification or high-throughput screening)18-20. Another advantage is that the concentration of specific proteins in Xenopus egg extract can be precisely adjusted by addition of recombinant protein and/or immunodepletion of endogenous proteins in contrast to transfection of plasmid DNA where expression of the protein of interest is difficult to control. In addition, the lack of available recombinant proteins can be overcome by the addition of transcripts encoding the protein of interest, taking advantage of the freshly prepared Xenopus egg extract’s high capacity to translate exogenously added mRNA. The regulation of protein degradation is critical for the control of many cellular pathways and processes21. Xenopus egg extract has been used extensively to study protein degradation as the system allows for multiple ways to monitor protein turnover without confounding influences of transcription and translation. The Wnt signaling pathway is a highly conserved signaling pathway that plays critical roles in development and disease. The turnover of β-catenin, the major effector of the Wnt pathway, is highly regulated, and an increased steady-state level of β-catenin is critical for the activation of Wnt target genes. The importance of β-catenin degradation is highlighted by the fact that mutations in the Wnt pathway that inhibit β-catenin degradation found in ~90% of all sporadic cases of colorectal cancer22. β-catenin degradation by components of the Wnt pathway can be faithfully recapitulated in Xenopus egg extract to study the mechanism of its turnover as well as to identify novel small molecule modulators of its degradation2,19,20,23-29 . Methods for the preparation of Xenopus egg extract for studying the cell cycle have been described in previous JoVE publications30-32. The current protocol describes a modification of these methods and is optimized for the degradation of [35S]-radiolabeled β-catenin and luciferase-tagged β-catenin in Xenopus egg extract. The radiolabeled degradation assay allows for direct visualization of protein levels via autoradiography. [35S]methionine is incorporated into the protein of interest using an in vitro translation reaction that can then be directly added to a degradation reaction. In addition, the radiolabeled protein turnover assay does not require an antibody against the protein of interest or an epitope tag, which can influence protein stability. Because even small changes in protein levels, as reflected in changes in the intensity of the radiolabeled protein band, are readily visualized by autoradiography, the [35S]-radiolabeled degradation assay represents a very useful method for visualization of protein turnover2. Fusion of β-catenin to firefly luciferase (hereafter referred to as simply "luciferase") allows for precise and facile quantitative measurements of protein levels, in order to determine the kinetic properties of β-catenin turnover19,20 . A major advantage of the luciferase assay is that it provides a strong quantitative system that is easily scaled up. The following protocol provides simple methods for assaying β-catenin degradation and a robust, efficient, and effective method for high-throughput screening of novel β-catenin modulators. NOTE: Each frog yields approximately 1 ml of usable egg extract. Extracts from 10 frogs are typically prepared at one time, and the volume of buffer described below is for performing a 10 frog Xenopus egg extract prep. The buffer volume can be adjusted accordingly for larger or smaller preparations of egg extract. Preps generated in this manner consistently yield protein concentrations ≥ 50 mg/ml. The process of collecting eggs and processing them into extract is most efficient when conducted by two people. (For basic frog husbandry techniques, see Sive et al.33). To prime the frogs, inject each female frog with 100 U of Pregnant Mare Serum Gonadotropin (PMSG) from a freshly made 250 U/ml stock. Use a 3 ml tuberculin syringe with a 27 G needle to inject subcutaneously, with the bevel of the needle up, into the dorsal lymph sac, which is located approximately 1 cm away from the midline from the notched discolorations along the length of the legs of the frog. Store primed frogs in water (plus 20 mM NaCl, see Sive et al.33) at 18 °C for 5-10 days. For standing water tank systems, the animal density is approximately 4 L of water per female frog. NOTE: The minimum time required for priming to take effect is 5 days, and the effects of priming wear off after 10 days. Prepare 0.5x Marc’s Modified Ringers (MMR) solution from a 20x MMR stock. 20x MMR consists of 2 M sodium chloride, 40 mM potassium chloride, 40 mM calcium chloride, 20 mM magnesium chloride, and 100 mM 4-(2-hydroxyethyl)-1-piperazineethanesulfonic acid (HEPES), pH 7.4. Set up buckets for all injected frogs (one frog per 4 L bucket). NOTE: Although more than one frog can be placed in the same bucket for egg collection, if one of the frogs lays predominantly poor quality eggs, a substantial amount of effort will be required to separate the poor quality eggs from those that are suitable for making extract. Thus, maximizing the number of frogs in the same tank to minimize the amount of buffer used for egg collect is not worth the risk. Inject 750 U Human Chorionic Gonadotropin (HCG) into the dorsal lymph sac of each frog using a 27 G needle as described in 1.1.1. Place each of the HCG-injected frogs into individual 4 L buckets containing 0.5x MMR cooled to 16 °C. Place the containers with the frogs in a 16 °C incubator to collect eggs O/N (15-16 hr). NOTE: Maintaining the proper temperature is critical for the entire procedure, from collecting eggs to preparing egg extract. NOTE: Eggs are covered with a jelly coat that must be removed prior to making extract. The likelihood of spontaneous lysis of the eggs increases as the time between egg laying and extract preparation increases. Thus, it is important to proceed through the following steps as rapidly as possible. Prepare 4 L of 1x MMR, 50 ml of 0.1x MMR, and 400 ml of 2% cysteine, pH 7.7, made in distilled water. Maintain all solutions at 16 °C. To expel additional eggs, gently squeeze the lower back and abdomen of the frog. Remove the frogs and the bulk of the MMR, to leave the eggs in approximately 1-200 ml of MMR in each bucket. Remove debris with a transfer pipette, and assess the quality of the eggs: high quality eggs are generally marked by a clear separation between the darkly pigmented animal hemisphere and the lightly colored vegetal hemisphere and have the highest dark-to-light contrast. Discard with a transfer pipette any eggs that appear stringy, mottled, or lysed (white and puffy) as they will decrease the overall quality of the extract. If >10% of the eggs are of poor quality, the entire batch should be discarded. Combine eggs into a 500 ml glass beaker and pour out as much MMR as possible while keeping eggs submerged. Rinse eggs by gentle swirling with twice the egg volume of MMR. Repeat twice, and remove any debris or obviously poor quality eggs. Add approximately 100 ml of 2% cysteine to the glass beaker, swirl gently to mix, and allow eggs to settle for 5 min at 16 °C. Pour off the cysteine. NOTE: Dejellying is marked by the gradual appearance of jelly coats floating above the eggs and the more compact packing of the eggs as they now occupy a smaller volume without the jelly coat. Add another 100 ml of 2% cysteine, gently swirl, wait 5 min, and then slowly pour off the cysteine. Repeat until eggs have become tightly compacted (usually by the third cysteine treatment). Note: If eggs are left too long in cysteine, they are prone to lysis. Similarly, dejellied eggs are fragile and prone to mechanical lysis if they are swirled too vigorously or if they are exposed to air. Once the eggs have been dejellied, it is important to rapidly proceed to the centrifugation steps. Pour off cysteine, and rinse away the jelly coat and other debris by gently washing eggs in 1x MMR. Pour off buffer carefully along the side of the beaker. Repeat twice or until MMR solution is no longer cloudy. While rinsing with 1x MMR continue to remove the bad eggs using a transfer pipette. Perform a final gentle rinse with 30 ml 0.1x MMR, and gently pour off as much of the buffer as possible. Again, remove any obviously bad eggs. NOTE: The extract described below that is used for β-catenin degradation is a variant of the cytostatic factor extract (metaphase II-arrested). In contrast to the low-speed and high-speed extract used for cell cycle studies, intermediate speed extract works best for β-catenin degradation. Interphase extract similarly promotes robust β-catenin degradation although is more labor intensive to prepare. Add Leupeptin, Pepstatin, Aprotinin mixture (LPA, a protease inhibitor) at 10 µg/ml (diluted from a 10 mg/ml stock solution in DMSO) and Cytochalasin D at 20 µg/ml (diluted from a 10 mg/ml stock solution in DMSO) into the remaining 20 ml of 0.1x MMR. Add 0. x MMR containing LPA and Cytochalasin D to the washed eggs, swirl gently, and incubate for 5 min at 16 °C. Transfer eggs into 16 °C pre-chilled 50 ml centrifuge tubes, allow the eggs to settle, and remove residual buffer from the top. To prevent exposure to air, withdraw a small amount of buffer into the transfer pipette prior to withdrawing eggs for transfer. Continue to transfer additional eggs into the centrifuge tubes and remove residual buffer from the top of the tube until the eggs fill the centrifuge tube to the top, which will maximize the yield of extract. To pack the eggs, spin centrifuge tubes at 400 x g for 60 sec at 4 °C using a fixed angle rotor. Remove residual buffer from the top of the centrifuge tubes. For the crushing spin, spin tubes at 15,000 x g for 5 min at 4 °C. NOTE: The method described below differs from the classic method of puncturing the side of the centrifuge tube in order to collect the cytoplasmic layer. This protocol has been adapted for simplification and for use with particular centrifuge tubes, which are reusable. No noticeable differences in the kinetics of β-catenin degradation are found with either method. At this point extract should be kept cold during throughout the process, and all steps should be performed at 4 °C. Clear a hole in the lipid layer using P1000 pipette tip. Collect the cytoplasmic layer (between the dark pigmented layer and the light lipid layer) using a new P1000 pipette tip into clean pre-chilled centrifuge tubes (Figure 1). For high-quality extract that robustly degrades β-catenin, minimize the amount of pigmented and lipid layer that is withdrawn with the cytoplasmic layer. Spin extracted cytoplasmic layer at 15,000 x g for 10 min at 4 °C and again collect the cytoplasmic layer. Repeat the spin and extraction 1X. NOTE: The extract should be "straw colored." If there is substantial contamination with the pigmented and lipid layers at this point, one can repeat the spin one more time, although excessive spins will decrease the capacity of the extract to degrade β-catenin. Add LPA and Cytochalasin D to the extract at final concentrations of 10 µg/ml each. NOTE: Using the method described yields a fairly consistent total protein concentration of approximately 50 mg/ml (52.41 ± 5.40 mg/ml, n=3 separate preps) in Xenopus egg extracts. (Optional) For translation assays, add capped mRNA (0.1 mg/ml), RNAsin (1.5 U/ml), and energy regeneration mix (2.2.1) and incubate the reaction at RT for 2 hr (for further information see Salic et al.2 and Sive et al.33). Use translated extract immediately for β-catenin degradation assays or snap-freeze in liquid nitrogen for later use. NOTE: Freshly prepared extract has a high capacity to translate exogenously added mRNA, but unfortunately, this capacity is lost once the extract is frozen. Capped mRNA can be readily prepared using commercially available kits. Snap-freeze extract in liquid nitrogen. NOTE: Extracts are stored in small (200 µl) aliquots for single use because they rapidly lose their capacity to degrade β-catenin if refrozen. For long-term storage, extract can be stored in liquid nitrogen. For short-term storage, extract can be stored at -80 °C, although the capacity of extract to degrade β-catenin can be dramatically reduced with extended storage at -80 °C (longer than 2 months). NOTE: A major advantage of Xenopus extract is the capacity to readily deplete components of a pathway and precisely add back a defined amount of a protein in order to determine its dose-dependent effects. Use freshly prepared Xenopus egg extract or quickly thaw frozen extract and place on ice. Perform all manipulations in the cold. Add extract to 1/10 the volume of pelleted antibody or affinity beads (e.g., 20 ml pelleted beads to 200 ml extract). In order to minimize dilution of the extract, withdraw as much liquid from the beads as possible before addition of the extract using gel loading tips with long, tapered tips. Rotate extract-bead mix at 4 °C for 1 hr. Spin extract-bead mix at 12,600 x g in microfuge at 4 °C for 30 sec. Alternatively, if magnetic beads are used, apply magnetic field to collect beads. Transfer depleted extract to a fresh microfuge tube on ice. Be careful not to transfer any beads with the extract. Confirm efficiency of depletion by immunoblotting both depleted extract and beads. Prepare extract for β-catenin degradation assay as described in 2.2. NOTE: β-catenin degradation in Xenopus egg extract is an energy-dependent process that quickly depletes the endogenous ATP stores. Consequently, an energy regeneration system is required to maintain robust β-catenin degradation. Prepare a 20x energy regeneration (ER) mix consisting of 150 mM creatine phosphate, 20 mM ATP, 600 µg/ml creatine phosphokinase, and 20 mM MgCl2. ER should be aliquoted and stored at -80 °C. Avoid repeated freeze/thaw cycles by using small frozen aliquots. Quickly thaw Xenopus egg extract by rubbing the frozen tube between hands. Place the tube on ice just before all of the extract has melted. Add 10 µl of energy regeneration mix (20x ER) into an aliquot (200 μl) of Xenopus egg extract. Mix thoroughly by quickly flicking the tube and pulse vortexing. Pulse-spin and immediately place on ice. (optional) The turnover of β-catenin can be slightly enhanced in Xenopus egg extract by addition of ubiquitin (1.25 mg/ml final). Cycloheximide (0.1 mg/ml final) can also be added to minimize translation of endogenous transcripts. Aliquot the appropriate volumes for degradation assay into pre-chilled microfuge tubes on ice. For radiolabeled β-catenin degradation assays, withdraw 2-5 ml extract for each time point. NOTE: All steps should be performed on ice unless otherwise indicated. Prepare freshly in vitro-synthesized [35S]methionine-radiolabeled protein using commercially available kits. NOTE: Generating 35S-labeled (half-life 87 days) proteins are easily and efficiently produced using commercially available in vitro-coupled transcription-translation kits. It is important that the translated protein is sufficiently labeled such that changes in protein turnover can be readily visualized. To confirm successful radiolabeling, perform SDS-PAGE/autoradiography with 0.5 µl of the translated protein. Quantify the intensity of the radiolabeled β-catenin band using ImageJ, ImageQuant, or an alternative quantitative software program. NOTE: The radiolabeled β-catenin protein band should be clearly visible on film within a few hours (4-6 hr). Snap-freeze the radiolabeled protein in liquid nitrogen for storage until use. Note: Prolonged storage (>2 months) and multiple freeze/thaw (greater than 2) can severely impact the capacity of the radiolabeled β-catenin to degrade robustly in Xenopus egg extract. Typically, the stability of radiolabeled proteins declines significantly after 1 month of storage at -80 °C; thus, relatively freshly prepared radiolabeled β-catenin gives best results in these degradation assays. Add 1-3 µl (depending on the strength of the radiolabeled band signal) of in vitro-translated β-catenin (and other proteins, small molecules, etc. that are being tested) into 20 µl of Xenopus reaction mix on ice. Mix thoroughly by quickly flicking the tube and a short pulse of vortexing; this is an important step as Xenopus egg extract is very viscous, and incomplete mixing will affect the consistency of the results. Pulse spin and place on ice. Start the β-catenin degradation reaction by shifting the tubes to RT. At the designated time point, remove 1-5 ml of the sample and mix immediately with SDS sample buffer (5x volume) to stop the reaction. To make sure the degradation reaction is completely terminated, flick tube several times and vortex vigorously. Perform SDS-PAGE/autoradiography. Run 1 ml equivalents (~50 mg of protein) of the extract for each time point/lane. Degradation of β-catenin in Xenopus egg extract should be evidenced by the time-dependent decrease in intensity of the radiolabeled β-catenin band Figure 2. Quantify results using ImageJ, ImageQuant, or other preferred imaging software if necessary. (optional) Soak SDS-polyacrylamide gel in fixing solution (10% acetic acid and 30% methanol in distilled water) prior to drying to decrease background radioactivity and increase the quality of the image. Perform all steps on ice unless otherwise indicated. Synthesize non-radiolabeled, luciferase-tagged β-catenin using the transcription-translation coupled system with complete amino acid mix. Confirm production of the luciferase-tagged β-catenin by measuring luciferase activity from 0.5-1 µl of the reaction. Assess background luminescence by measuring luminescence from an untranslated reaction mix. NOTE: Multiple commercial kits are available for measuring luciferase activity. Long-lived luminescence, however, works particularly well for the degradation assay. Thaw and prepare Xenopus egg extract as in 2.2. Add in vitro-translated β-catenin-luciferase fusion (from 4.1) into prepared Xenopus reaction mix (from 2.2) on ice and mix well as in 3.2.1. NOTE: The activity of the β-catenin luciferase that is added to the extract is typically between 20 - 50,000 relative luminescence units (RLU)/ml of extract (based on measurements obtained from 4.1.2). Starting signal should be approximately 100,000 RLU (2-5 ml of the in vitro-translated β-catenin-luciferase fusion). Shift the extract to RT to start the degradation reaction. Remove an aliquot of the reaction at the indicated time and snap-freeze in liquid nitrogen. NOTE: Triplicate samples are typically removed for analysis for each time point. Frozen extract can be stored at -80 °C until they are ready to be analyzed. Thaw samples ice, transfer samples to standard white 96-well plates on ice, and process for luciferase activity. A schematic of β-catenin degradation in Xenopus egg extract is shown in Figure 2A. 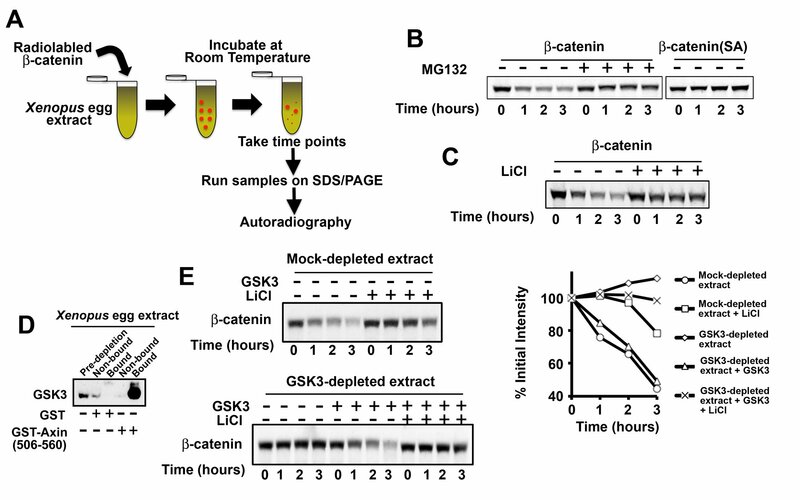 35S-labeled β-catenin was incubated in Xenopus egg extract, aliquots (1 ml extract equivalent) were removed at the appropriate times, and samples were subjected to SDS-PAGE followed by autoradiography. β-catenin degradation by components of the Wnt pathway is mediated by the ubiquitin-proteasome system2, and degradation of [35S]-radiolabeled β-catenin in Xenopus extract is inhibited by addition of the proteasome inhibitor MG132 Figure 2B. Degradation of β-catenin by components of the Wnt pathway is dependent on its phosphorylation by GSK334. GSK3-dependent degradation can be readily demonstrated in multiple ways using Xenopus egg extract: 1) The β-catenin(SA) mutant (GSK3 phosphorylation sites mutated to alanines) is stabilized in Xenopus egg extract relative to wild-type β-catenin protein Figure 2B. 2) Small molecule inhibitors of GSK3 (LiCl) similarly inhibit degradation of β-catenin (Figure 2C). 3) Finally, depletion of GSK3 from Xenopus egg extract inhibits degradation of β-catenin; degradation can be rescued by addition of exogenous GSK3 Figures 2D-E. The radiolabeled β-catenin degradation assay provides a particularly informative visual assessment of its mode of degradation (i.e. ubiquitin-mediated degradation versus apoptotic cleavage). Autoradiography, however, is labor intensive, and, for the most part, limited for high-throughput analysis of the pathway (e.g., screening for small molecule modulators of the Wnt pathway). The β-catenin-luciferase degradation assay is more easily and quickly quantifiable as the amount of luminescence emitted is directly proportional to the amount of β-catenin-luciferase protein. This feature makes the luciferase assay simple and readily adaptable for high-throughput assays. It is important to determine that the luciferase fusion has similar properties as that of the nonfusion protein. This can be empirically determined by fusing the luciferase protein to the N- terminus, C- terminus, or internally. Fusion of luciferase to the N-or C-terminus of β-catenin does not affect its capacity to activate Wnt target genes incultured mammalian cells or its turnover rate in Xenopus egg extract2,19,20. A representative β-catenin-luciferase degradation assay in Xenopus egg extract is shown in Figure 3A in which degradation of β-catenin-luciferase was assessed by SDS-PAGE/autoradiography of the radiolabeled protein and luciferase activity of the fusion. The rate of degradation of the β-catenin-luciferase is similar to the untagged β-catenin protein. 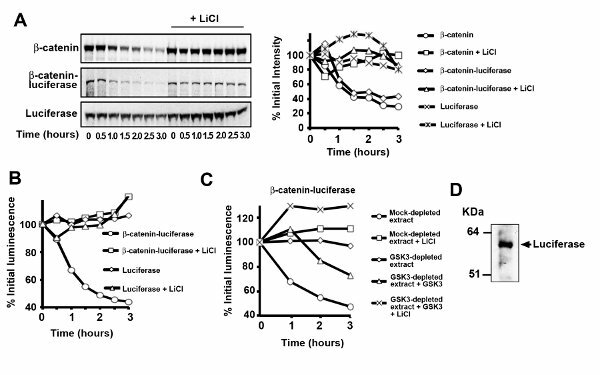 The regulation of degradation for the β-catenin-luciferase fusion is essentially identical to the nonfusion protein as the addition of LiCl or depletion of GSK3 resulted in inhibition of β-catenin-luciferase turnover. As shown in Figures 3B-C, changes in the radioactive signal of the β-catenin-luciferase protein parallels the changes in luciferase enzymatic activity over time. An issue that arises from using β-catenin-luciferase (particularly fusion protein generated from the in vitro transcription-translation system) is the background luciferase signal caused by use of internal translational start sites or premature translational termination Figure 3D. This problem can sometimes be overcome by optimizing the DNA concentration used in the IVT reaction. We did not, however, observe a decrease in background luciferase activity when we varied the plasmid DNA concentration for our particular β-catenin-luciferase construct. It is likely that we will need to reengineer the fusion protein via mutagenesis in order to further minimize internal translational start sites and/or premature translational termination of the β-catenin-luciferase fusion protein. Because the luciferase protein is fairly stable over the time course of the degradation reaction in Xenopus egg extract Figure 3A, however, this background signal can be simply subtracted if the ratio of the truncated luciferase protein to the full-length β-catenin fusion is known. A strength of the luciferase assay is the capacity to scale to a multi-well format that allows for performing high-throughput screening for modulators of β-catenin degradation. In Figure 4, a representative checkerboard analysis is shown using an inhibitor of β-catenin degradation, MG132, which inhibits the proteasome. The result of the checkerboard experiment indicates that the assay is uniform and reproducible in a 96-well format and demonstrates its suitability for high-throughput screening. Figure 1. A schematic representation of the preparation of concentrated Xenopus egg extract. Eggs are collected from HCG-injected Xenopus laevis females, compacted with a low-speed (400 x g) spin, and crushed and separated with a medium-speed (15,000 x g) spin. Take care to inject subcutaneously into the dorsal lymph sac, remove the bad eggs carefully, and carefully separate the high-quality cytoplasmic extract from the lower-quality darker extract as noted in the text. Figure 2. β-catenin degrades robustly when incubated in Xenopus egg extract. A) A schematic of a degradation assay. B) [35S]-labeled β-catenin prepared by an IVT reaction degrades robustly when incubated in Xenopus egg extract. Addition of MG132 (200 µM) to Xenopus egg extract inhibits β-catenin degradation. Mutation to alanines of the GSK3 phosphosites within β-catenin (β-catenin SA) or addition of LiCl (25 mM) C) inhibits β-catenin degradation. D) The GSK3 binding site of Axin (amino acids 506-560) efficiently depletes GSK3 from Xenopus egg extract. E) GSK3-depleted Xenopus egg extract inhibits β-catenin degradation and can be rescued by addition of recombinant GSK3 (0.1 mg/ml). 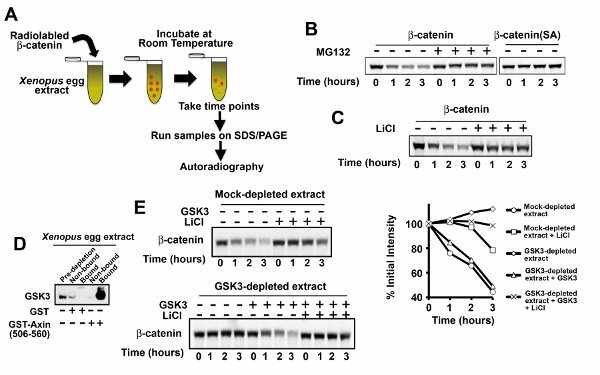 Addition of LiCl (25 mM) blocks the capacity of recombinant GSK3 to rescue β-catenin degradation in GSK3-depleted extract. Click here to view larger image. Figure 3. Luciferase-tagged β-catenin degrades when incubated in Xenopus egg extract. A) Radiolabeled β-catenin-luciferase degrades at a rate similar to that of untagged β-catenin protein. 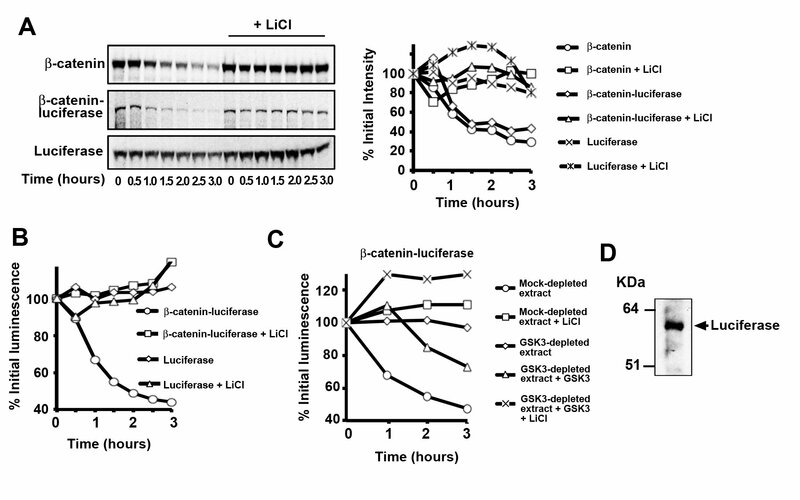 As with the wild-type protein, addition of LiCl (25 mM) inhibits β-catenin-luciferase degradation. Luciferase alone does not noticeably turn over in Xenopus egg extract. Changes in luciferase activity of the β-catenin-luciferase fusion parallel the changes in its protein levels. B) Addition of LiCl (25 mM) or depletion of GSK3 C) inhibits β-catenin-luciferase turnover as assessed by measuring luciferase activity. D) Immunoblotting for in vitro translated β-catenin-luciferase (using an anti-luciferase antibody) revealed significant amounts of free luciferase protein in certain preps that likely contributes to the higher background when compared to the radiolabeled degradation assay. Click here to view larger image. Figure 4. Regulated degradation of β-catenin-luciferase in Xenopus extract can be adapted to a high-throughput format. A representative checkerboard analysis for β-catenin-luciferase using MG132 (450 µM) as an inhibitor of β-catenin degradation. Shaded columns indicate MG132-treated wells, and lighter columns represent vehicle (DMSO)-treated wells. Quantification and Z-factor calculation result in a score of 0.3 indicating an acceptable assay for potential use in high-throughput screening. Xenopus egg extract is a robust biochemical system for investigating β-catenin turnover. The concentration of β-catenin in Xenopus egg extract is ~25 nM 2. Under optimal conditions, the egg extract is capable of degrading β-catenin at a rate of 50-100 nM/hr and is half-maximal at 200 nM24. There are several critical steps for successful reconstitution of β-catenin degradation using Xenopus egg extract. These include 1) generating high quality Xenopus egg extract and the manner by which egg extract is prepared, 2) generating quality radiolabeled β-catenin and β-catenin-luciferase protein, 3) optimizing reaction conditions to support β-catenin degradation, and 4) proper processing of reaction time points. 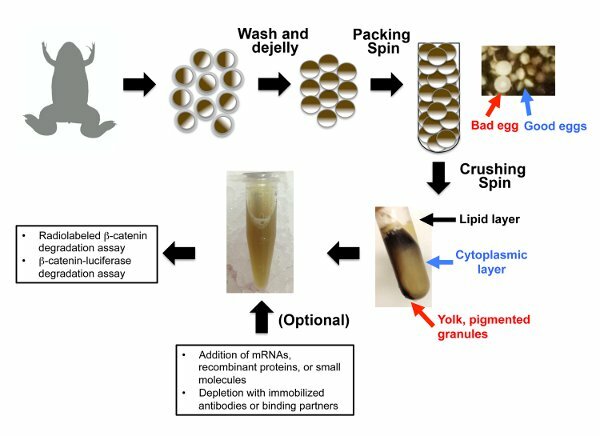 A high-quality preparation of Xenopus egg extract in which β-catenin is robustly degraded depends on both the quality of the eggs and how the eggs are handled prior to the crushing step as well how the extract is subsequently centrifuged to obtain the final extract. As mentioned in the protocol, it is important to ensure that only high quality eggs (evidenced by sharp contrast between the dark animal hemisphere and light vegetal hemisphere) are used, that poor quality eggs (stringy, mottled, or white puffs) are removed throughout the process, that eggs are maintained at a cool temperature (16 °C) throughout the procedure, and that the procedure is carried out as quickly as possible. It is important not to sacrifice quality for quantity of extract. Additionally, as previously mentioned, eggs from a frog that lays poor quality eggs (>10%) should be entirely discarded. The extract described above is a modification of meiosis II-arrested CSF extract11. The preparation of Xenopus egg extract for β-catenin degradation (intermediate speed extract) differs from classic extracts prepared for studying cell cycle30-32, which are low-speed or high-speed extracts35. Adapting Xenopus egg extract for optimal degradation of other proteins may require altering the centrifugation speed and number of spins. Low-speed extract contains intact organelles and other large cellular components. Thus, higher speed spins will alter the composition of the extract and potentially remove inhibitory and/or essential components that will affect degradation of the protein of interest. The preparation of intermediate speed extract herein described is optimized for degradation of β-catenin by components of the Wnt pathway. Spinning the extract greater than 4X can significantly decrease the capacity of the extract to degrade β-catenin (although it has minimal effect on the degradation of another Wnt component, Axin). β-catenin is susceptible to caspase-mediated proteolysis in low-speed spin extract and does not noticeably degrade in high-speed spin extract. Thus, it is likely that different speed extracts will be optimal for degradation of components of other signaling pathways. The generation of 35S-β-catenin and β-catenin-luciferase can be performed using a number of commercially available kits. Protein production using transcription-translation coupled systems is highly dependent on the quality of the plasmid: highly pure midi-preparations of plasmids work better and are more reliable compared to DNA mini-preparations. For radiolabeling β-catenin, freshly obtained [35S]methionine or translabel ([35S]methionine plus [35S]cysteine) is preferred. Note that methionine and cysteine both have a tendency to oxidize with prolonged storage thereby decreasing their incorporation into β-catenin in the in vitro transcription-translation coupled reaction. Because prolonged storage and repeated freeze-thawing cycles can inhibit degradation, small amounts of the radiolabeled β-catenin are prepared at a time and used soon after. The amount of protein translated and the number of methionines in the protein determine the strength of the radiolabeled signal. For β-catenin, there should be no problems obtaining strong radioactive signals for degradation assays. For proteins with few methionines and/or that do not translate well, a [35S]methionine and [35S]cysteine mix can be used instead of [35S]methionine and/or added an epitope tag (Myc) that contains multiple methionines. Although success with various expression plasmids containing the appropriate phage promoters (T7, T3, and SP6) can be obtained for in vitro transcription-translation reactions, pCS2-based plasmid generally gives the best results. In addition, the signal of the translated protein can sometimes be dramatically increased by deleting the endogenous 5’ UTR. Finally, for large-scale experiments (e.g., high-throughput screening), a large quantity of recombinant β-catenin-luciferase may be required. β-catenin-luciferase from the Sf9/baculovirus system degrades with similar kinetics as the wild-type β-catenin in Xenopus extract and embryos2. Alternatively, a high-yield in vitro expression system (e.g. wheat germ-based) has been successfully used for high-throughput screening19,20. In order to reliably measure the degradation of β-catenin in the extract system, it is important that the initial signal from either the radiolabeled β-catenin or the luciferase β-catenin fusion is sufficiently robust. Thus, some amount of optimization by the experimenter on the size of the degradation assay, the number of time points needed, and the efficiency of the in vitro translation reaction will be required. When assembling the degradation reaction, there are several steps one can take to enhance the chance of obtaining robust degradation. Firstly, all reagents should be thawed quickly and placed on ice prior to their complete thaw. Because the degradation of β-catenin is highly energy dependent, it is important that the ER is relatively fresh. Secondly, Xenopus egg extract is viscous, and it is critical that the reaction is thoroughly mixed after addition of radiolabeled β-catenin/β-catenin-luciferase fusion, ER, protein, small molecule modulators, etc. Thirdly, pre-incubating the reaction mix for 20-30 min on ice gives more reproducible results when testing effects of small molecule modulators. The capacity to deplete proteins from Xenopus egg extract represents a powerful tool to assess protein function and their concentration-dependent effects. As an example, we demonstrate that depleting GSK3 from Xenopus egg extract blocks the degradation of β-catenin, indicating the important role of GSK3 in β-catenin turnover. Different depletion conditions will need to be empirically determined for different proteins. For example, abundant proteins will require an increase in the amount of antibody or affinity ligand beads used to achieve full depletion. A good starting point is to use packed beads at 1/10 the volume of the extract in order to minimize extract dilution. In addition to the strength of binding of the antibody/affinity ligand to the target protein, the type of beads (e.g., sepharose, agarose, or magnetic) used may impact the efficiency of protein depletion from Xenopus egg extract36. 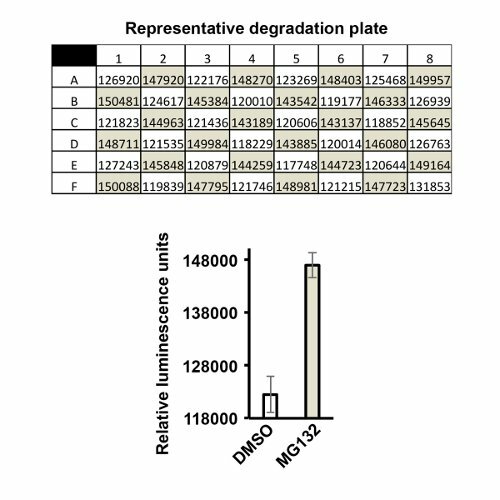 Finally, it would be ideal to analyze the extent of depletion (typically by immunoblotting). Once the β-catenin reaction is completed, the manner by which the samples are processed can greatly affect the results of the experiment. The concentration of Xenopus egg extract preps prepared in the manner described is 52.41 mg/ml ± 5.40 mg/ml, and it is important not to overload the capacity of the SDS-PAGE gel; this is not a problem with the luciferase-β-catenin assay. Thus, for each time point, no more than 1 ml equivalent of extract should be loaded into each lane of an SDS-PAGE gel. 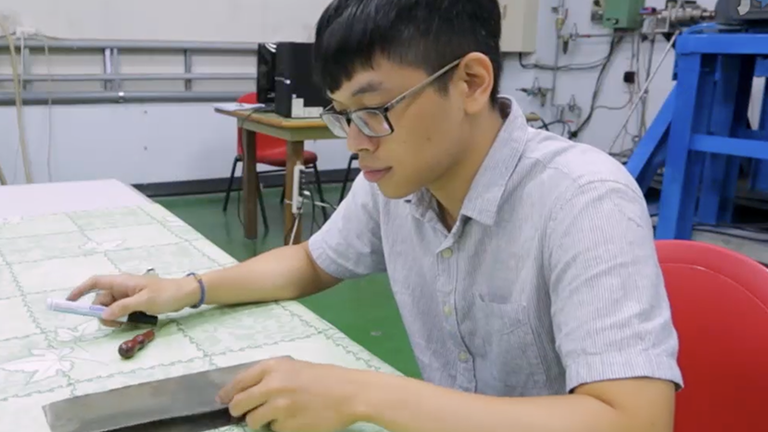 To further enhance the quality of the results, the gel fixation step (optional) will decrease background radioactivity and increase the signal-to-noise ratio. For the luciferase assay, a decrease from an initial signal of 100,000 RLU in Xenopus egg extract faithfully reflects the change in the protein levels of the β-catenin-luciferase fusion protein. The Xenopus egg extract system represents an attractive system to study the regulation of β-catenin degradation. The extract system allows for the precise control of the concentration of individual proteins via depletion and reconstitution. The capacity to monitor their effects on the kinetics of β-catenin turnover over time allows for a better understanding the biochemical mechanism of this crucial step in Wnt signal transduction. Such manipulations have provided deep insight into the complex molecular interactions between components of the Wnt pathway and were critical for the development of the first mathematical model of the Wnt pathway24. One caveat is that the concentrations of Wnt pathway components in Xenopus egg extract and mammalian cell lysates have been found to differ, possibly reflecting differences in the way the Wnt pathway is regulated during embryogenesis versus the adult situation37. The capacity to perform both radioactive and enzymatic, luciferase-based assays using Xenopus egg extract provides added powerful complementary qualitative and qualitative tools for studying the biochemical regulation of β-catenin degradation. In addition to monitoring the turnover of β-catenin, degradation of the negative Wnt regulator, Axin, can be monitored in Xenopus egg extract either as a radiolabeled protein or fusion to luciferase. Using a variant of luciferase, Renilla, fused to Axin, was previously adapted for the luciferase degradation assay into a high-throughput format to simultaneously screen for modulators of two Wnt pathway proteins, β-catenin and Axin19,20 . This biochemical screen identified the FDA-approved drug, pyrvinium that increased and decreased the degradation rate of β-catenin and Axin, respectively, in Xenopus egg extract19. Pyrvinium was subsequently validated in cultured human cells and in various model organisms (e.g., Xenopus and C. elegans) as a small molecule inhibitor of the canonical Wnt pathway. In summary, the Xenopus egg extract system is a versatile biochemical system that can be exploited in a multitude of ways to study the mechanism of Wnt signaling as well as for identification of small molecule modulators of the Wnt pathway. The biochemical method described herein can be applied to other signaling pathways in which protein degradation may play a critical role. We thank Laurie Lee for critical reading of the manuscript. T.W.C is supported by an American Heart Association Predoctoral Fellowship (12PRE6590007). M.R.B. is supported by a National Cancer Institute training grant (T32 CA119925). S.S.H is supported by National Institutes of Health (R01DK078640). E.L. is supported by the National Institutes of Health (R01GM081635 and R01GM103926). Pregnant mare serum gonadotropin (PMSG) ProSpec hor-272-A Reconstituted with distilled water before use. Glotzer, M., Murray, A. W., Kirschner, M. W. Cyclin is degraded by the ubiquitin pathway. Nature. 349, 132-138 (1991). Salic, A., Lee, E., Mayer, L., Kirschner, M. W. Control of beta-catenin stability: reconstitution of the cytoplasmic steps of the wnt pathway in Xenopus egg extracts. Molecular Cell. 5, 523-532 (2000). Murray, A. W. Cell cycle extracts. Methods in cell biology. 36, 581-605 (1991). Dabauvalle, M. C., Scheer, U. Assembly of nuclear pore complexes in Xenopus egg extract. Biology of the cell / under the auspices of the European Cell Biology Organization. 72, 25-29 (1991). Tutter, A. V., Walter, J. C. Chromosomal DNA replication in a soluble cell-free system derived from Xenopus eggs. Methods Mol Biol. 322, 121-137 (2006). Theriot, J. A., Rosenblatt, J., Portnoy, D. A., Goldschmidt-Clermont, P. J., Mitchison, T. J. Involvement of profilin in the actin-based motility of L. monocytogenes in cells and in cell-free extracts. Cell. 76, 505-517 (1994). Shennan, K. I. Xenopus egg extracts: a model system to study proprotein convertases. Methods Mol Biol. 322, 199-212 (2006). Kornbluth, S., Yang, J., Powers, M. Analysis of the cell cycle using Xenopus egg extracts. Current protocols in cell biology / editorial board, Juan S. Bonifacino ... [et al.]. 11, (2006). Masui, Y., Markert, C. L. Cytoplasmic control of nuclear behavior during meiotic maturation of frog oocytes. The Journal of experimental zoology. 177, 129-145 (1971). Forbes, D. J., Kirschner, M. W., Newport, J. W. Spontaneous formation of nucleus-like structures around bacteriophage DNA microinjected into Xenopus eggs. Cell. 34, 13-23 (1983). Lohka, M. J., Masui, Y. Formation in vitro of sperm pronuclei and mitotic chromosomes induced by amphibian ooplasmic components. Science. 220, 719-721 (1983). Newport, J. W., Kirschner, M. W. Regulation of the cell cycle during early Xenopus development. Cell. 37, 731-742 (1984). Blow, J. J., Laskey, R. A. Initiation of DNA replication in nuclei and purified DNA by a cell-free extract of Xenopus eggs. Cell. 47, 577-587 (1986). Verma, R., et al. Ubistatins inhibit proteasome-dependent degradation by binding the ubiquitin chain. Science. 306, 117-120 (2004). Yu, H., King, R. W., Peters, J. M., Kirschner, M. W. Identification of a novel ubiquitin-conjugating enzyme involved in mitotic cyclin degradation. Curr Biol. 6, 455-466 (1996). Thorne, C. A., et al. Small-molecule inhibition of Wnt signaling through activation of casein kinase 1alpha. Nature Chemical Biology. 6, 829-836 (2010). Thorne, C. A., et al. A biochemical screen for identification of small-molecule regulators of the Wnt pathway using Xenopus egg extracts. Journal of Biomolecular Screening. 16, 995-1006 (2011). Hinkson, I. V., Elias, J. E. The dynamic state of protein turnover: It's about time. Trends in Cell Biology. 21, 293-303 (2011). Kinzler, K. W., Vogelstein, B. Lessons from Hereditary Colorectal Cancer. Cell. 87, 159-170 (1996). Lee, E., Salic, A., Kirschner, M. W. Physiological regulation of [beta]-catenin stability by Tcf3 and CK1epsilon. J Cell Biol. 154, 983-993 (2001). Lee, E., Salic, A., Krüger, R., Heinrich, R., Kirschner, M. W. The roles of APC and Axin derived from experimental and theoretical analysis of the Wnt pathway. PLoS Biology. 1, (2003). Seeling, J. M., et al. Regulation of beta-catenin signaling by the B56 subunit of protein phosphatase 2A. Science. 283, 2089-2091 (1999). Guger, K. A., Gumbiner, B. M. beta-Catenin has Wnt-like activity and mimics the Nieuwkoop signaling center in Xenopus dorsal-ventral patterning. Dev Biol. 172, 115-125 (1995). Cselenyi, C. S., et al. LRP6 transduces a canonical Wnt signal independently of Axin degradation by inhibiting GSK3's phosphorylation of β-catenin. Proceedings of the National Academy of Sciences. 105, 8032-8037 (2008). Jernigan, K. K., et al. Gbetagamma activates GSK3 to promote LRP6-mediated beta-catenin transcriptional activity. Science Signaling. 3, (2010). Major, M. B., et al. Wilms tumor suppressor WTX negatively regulates WNT/beta-catenin signaling. Science. 316, 1043-1046 (2007). Cross, M. K., Powers, M. Obtaining eggs from Xenopus laevis females. J Vis Exp. (2008). Cross, M. K., Powers, M. Preparation and fractionation of Xenopus laevis egg extracts. J Vis Exp. (2008). Willis, J., DeStephanis, D., Patel, Y., Gowda, V., Yan, S. Study of the DNA damage checkpoint using Xenopus egg extracts. J Vis Exp. (2012). Sive, H. L., Grainger, R. M., Harland, R. M. Early Development of Xenopus Laevis : A Laboratory Manual. Cold Spring Harbor Laboratory Press. (2000). Rubinfeld, B., et al. Binding of GSK3β to the APC-β-Catenin Complex and Regulation of Complex Assembly. Science. 272, 1023-1026 (1996). Salic, A., King, R. W. Identifying small molecule inhibitors of the ubiquitin-proteasome pathway in Xenopus egg extracts. Methods in Enzymology. 399, 567-585 (2005). Trinkle-Mulcahy, L., et al. Identifying specific protein interaction partners using quantitative mass spectrometry and bead proteomes. J Cell Biol. 183, 223-239 (2008). Tan, C. W., et al. Wnt signalling pathway parameters for mammalian cells. PLoS One. 7, (2012).